FOR any lover of impressionistic art, and especially artist Claude Monet, here are some very special “not to be missed” places to explore these fine works of art up close and personal. Please enjoy my favorite places when I am in Paris and in need of a “Monet-fix”—-Parisian style, but of course! Museum is closed on Mondays. 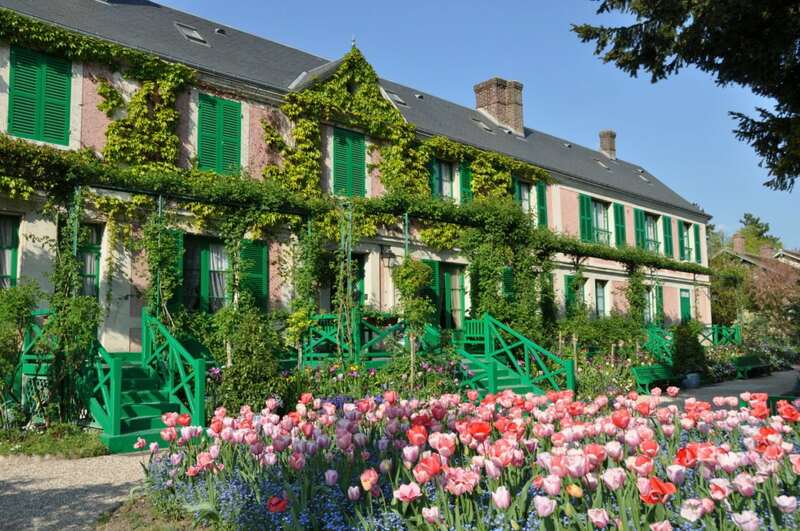 Marmottan Monet Museum – This museum is located in an elegant residential neighborhood, with expansive grounds. 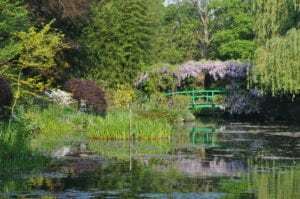 It is a less traveled hide-away in the posh 16th Arrondissement (district) near the corner of Bois de Boulogne. It now houses the largest collection of Monet art in the world. There are 136 Monet paintings right here. The painting Impression Sunrise can be viewed here, and this very painting gave its name to the art movement of impressionism. Photos, caricatures, drawings and other artwork is also displayed at Marmottan. I was curious about the background of this Museum as it is located in a quiet residential neighborhood. Having done some additional research, the property has a unique history. The home was a former hunting lodge of Christophe Edmond Kellerman, the Duke of Valmy, and was purchased by Jules Marmottan in 1882. His son Paul settled there, and had another hunting lodge built to house his private collection of art pieces, Empire-style furniture and First Empire paintings. Upon his death in 1934, he bequeathed his collections, his townhouse (which would later become the Marmottan Monet Museum), and the Boulogne Library’s historical archives, to the French Academy of Fine Arts. In 1957, the Marmottan Monet Museum received the private collection of Madame Victorine Donop de Monchy as a donation inherited from her father, Doctor Georges de Bellio, one of the first lovers’ of impressionism whose patients included the likes of: Manet, Monet, Pissaro, Sisley, and Renoir. 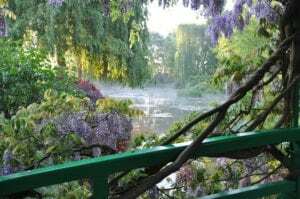 In 1966, Michel Monet, the painter’s second son, was killed in a car accident, and in his will had promised his property in Giverny to the French Academy of Fine Arts and his collection of paintings, inherited from his father, to the Marmottan Monet Museum. This donation entrusted the Museum with the largest Claude Monet collection in the entire world. Additionally, art work acquired by Henri Duhem and his wife Mary Sergeant were donated by their daughter Nelly Duhem in 1987. A painter and post-impressionists himself, Henri Duhem was a passionate art collector and gathered the works of his contemporaries. In 1996, the Denis and Annie Rouart Foundation gave the Museum prestigious works by: Berthe Morisot, Edouard Manet, Edgar Degas, and Henri Rouart. The second floor of the Museum has a great deal of impressionist art with many paintings from Berthe Morisot, and hosts many other temporary exhibits. The Monet paintings are housed in a modern basement gallery and many of them are of a very large format— including the water lilies. Some of the paintings are very abstract and illustrate that Monet was ahead of his time. There are many benches for visitors to rest and admire the large paintings at their leisure. And with smaller crowds, it is a joy to wonder and contemplate the works of art. The bookstore abounds with Monet memorabilia, and I found the posters to be rather inexpensive. Near the museum is a large and delightful park. Musee de L’Orangerie – Established in 1852, this museum is located at the edge of the Jardin des Tuileries and is a very popular attraction, so expect a line for entry into the museum. It is also very walkable to & from the Musse d’Orsay, on the opposite bank of the Seine River. Claude Monet chose this museum to display his 19 panel water lily paintings, known as the Nympheas. The very large format is very dramatic to see in person, with each panel measuring 300 feet long and 6 feet and 7 inches high (91 meters by 2 meters). On the upper gallery, there are two large oval rooms that house the Nympheas. The oval rooms were custom designed so that 8 huge paintings of the water lilies fit exactly on the walls. The paintings show the delicate changes of the water lilies during different times of day. 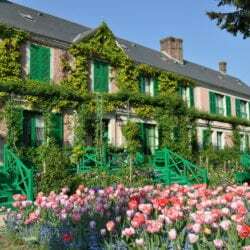 This museum also has the Jean Walter and Paul Gillaume Collection, which has 144 paintings by Cezanne, Renoir, Monet, Picasso, Matisse, Modigliani and Soutine. Paul Guillaume was a famous art dealer who sold the art of the impressionists and post-impressionists. He collected their art also. When he died at the age of 42, his beautiful widow Domenica married the mining tycoon Jean Walter and later left the art collection to the museum. You will notice that many of these artists painted Domenica. Giverny- Visiting Claude Monet’s Country Home —Just Over An Hour From Paris…. And So Worth The Trip! 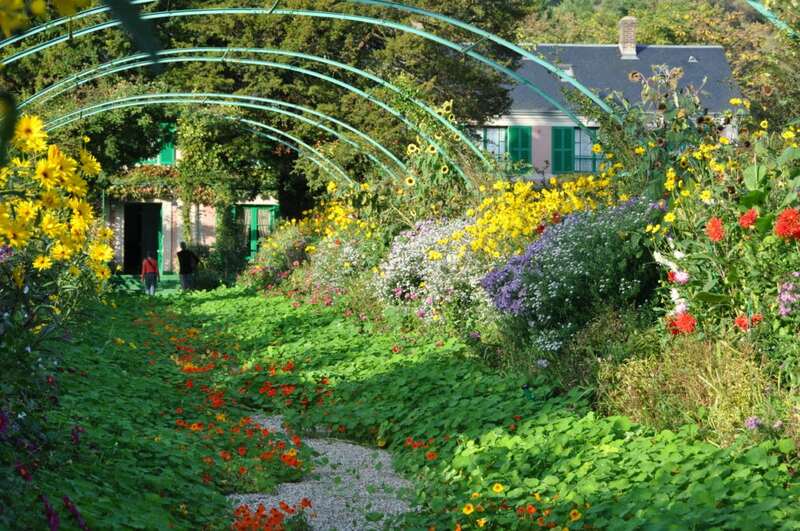 For any “Impressionist Art Lover” visiting Giverny is, well— a must. There I said it! It is located in the south east corner of the Normandy region and takes just over an hour by car from Paris. There is also a train route nearby. But getting out into the countryside to see this village is well worth the effort. There are basically three options: 1) Rent a car and drive (be sure to get a good map and directions), 2) Take a train—From Gare Saint Lazare Station in Paris to Vernon (50mn), and at the Vernon train station, take a coach shuttle that connects to Giverny in 30 mn (4 miles) or by taxi; or 3) Take an organized day trip. The benefit of the day trip is that it also includes transportation and a guided tour. This five hour adventure to Giverny and back again departs from the city center every day of the week! Monet moved there with his family in 1883, and lived there until he passed away in 1926. He purchased the almost 4-acre and had a vision to create his studio right in a garden setting. To this end, he transformed the grounds to the enchanted gardens we see today and he painted so long ago. Amazingly, he designed his entire garden, and had a staff to assist him with the gardening. They dug the lake, built the bridges, and selected all the flowers, plants and trees. Toward the end of his life he had up to six gardeners on staff. He constructed his settings to then paint it. And the rest is indeed history! Visiting Claude Monet’s home was an ethereal experience for me. 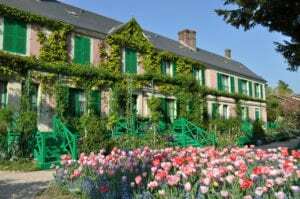 His home garden “Clos Normand” with flowerbeds and tall plantings in organized rows welcome guests to his abode. I could just imagine him standing there surveying his colorful collection each day. He just loved flowers. The home is pink with green accents, and delicate climbing roses envelop the entire front and side wall. A long porch runs the entire length of the house. Inside, his world-famous collection of Japanese engravings and ceramics are still there. 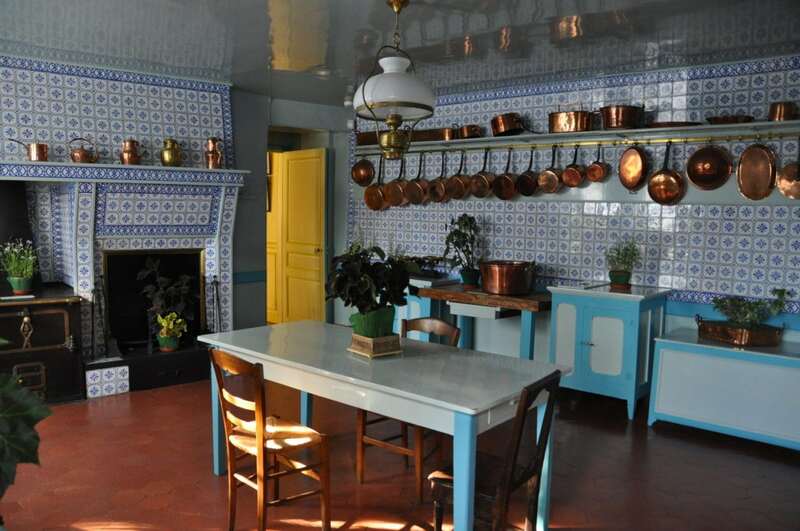 His kitchen was cheerful, in a sea of blue with tiles from Normandy. Walking through it appeared as though you could light the stove and begin cooking! The dining room is a warm yellow. I was so pleased to see how well it was preserved. The huge barn-like gift shop of today used to be Monet’s painting studio where he painted the enormous water lilies series (now housed in the Musee de l’Orangerie in Paris—just at the edge of the Jardin des Tuileries). After visiting his home, visitors walk along a pathway winding down into a tunnel with the roadway above, and in moments are up on the other side. The surprise of a lifetime is to not just see—but be right there in the setting of his many paintings! It was a mind-warp for me. As I walked around the pond and observed the famed Japanese green bridge, I found myself in the moment—smelling the garden, and then for a moment, looking at the painting as though I was in a museum. It was quite strange. Snapshots would flash in my mind of paintings I have admired for many, many years! It is such a beautiful and peaceful place. I looked around behind the pathway to imagine just where he would have placed his easel and chair. The water lilies gently float on the pond, and as the light changes, one can imagine the various paintings Monet so eloquently rendered in this very serene place. I was fortunate to be there in the afternoon and the crowds had disappeared. I was able to take pictures and just be still and enjoy the sounds of nature. The town is a sleepy, rather unimpressive place today. I was surprised to learn that there was an entire community who lived in this village with 300 inhabitants at Monet’s time and it hasn’t changed much with 500 people nowadays. The artist colony consisted mostly of American painters. Monet is buried behind the little old church. The grave is planted with flowers. Open: Giverny is closed in the winter months. In 2013 it will be open every day of the week from March 30th to November 1st. The next in our Series will cover a seven day river cruise through Provence in the south of France—from small villages to famous towns. Dining in the oldest restaurant in Lyon to visiting a small family run winery. We will visit: Beaune, Lyon, Perouges, Vienne, Tournon, Tain L’Hermitage, Viviers, Arles, Les Baux, Pont du Gard and Avignon! FOR any lover of impressionistic art, and especially artist Claude Monet, here are some very special “not to be missed” places to explore these fine works of art up close and personal. Please enjoy my favorite places when I am in Paris and in need of a “Monet-fix”----Parisian style, but of course!